I could fill a blog with the crazy things you see in government. I generally eschew that stuff because I think people will find it boring, but for you non-government types here’s a quick glimpse behind the curtains. Both of these are from yesterday (Tuesday). 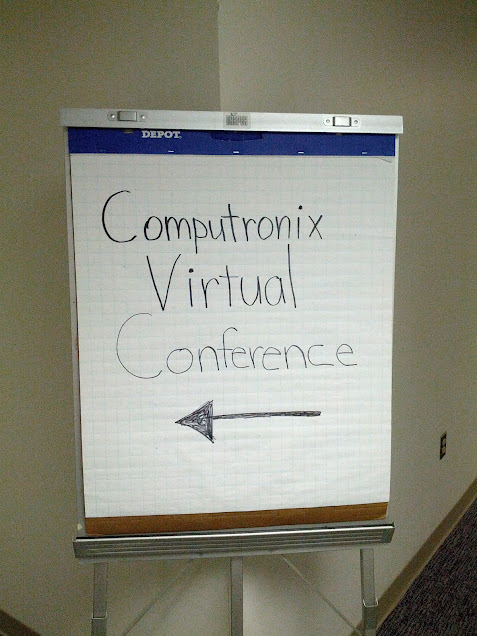 Yes, that’s a physical sign pointing to a physical location for a virtual conference. Translation: In the past we made some procurement and/or development decisions that, in retrospect, were ill-advised. If you make a modern web browser like Chrome your default and try to open a page with ActiveX controls and other horrors of bygone eras, you could be boned. We can’t upgrade these systems because the vendor is out of business and/or all the people that worked on the original project have died. 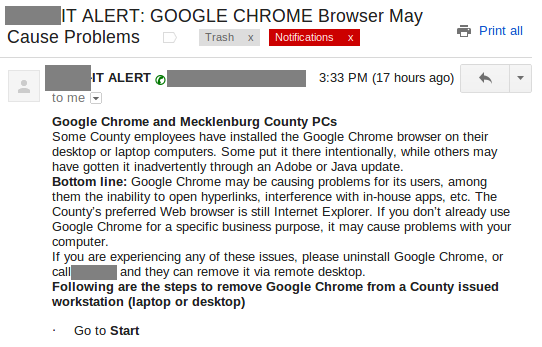 To save time, please go ahead and uninstall Firefox too. And Safari. And Opera (yes, both of you). Don’t worry about the latest unpatched zero-day exploit. $ wipe your hard drive < $ upgrade our crufty old apps.